The Jazz Province travelling festival covers 5,000 kilometres every year, visiting 10 Russian cities. In what has become an annual autumn tradition in Russia, a group of international jazz musicians performed in a series of concerts across the country. 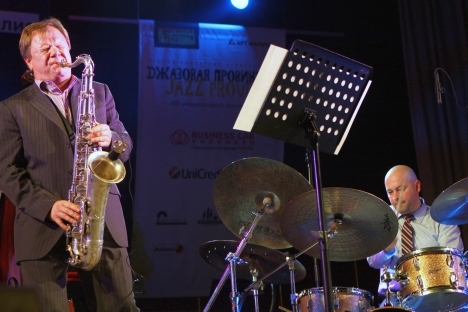 The Jazz Province international music festival held its final concert this year in Pskov. In the space of a month, its performers visited over 10 Russian cities — from Krasnoyarsk in Siberia to Krasnodar in the south. Thanks to Jazz Province’s travelling format, music lovers who live far away from the cultural capitals of the country have been getting access to high-quality jazz for the last 17 years. Finances make it impossible to invite the most famous jazz performers, but the festival boasts brilliant world-class jazz musicians and little-known Russian jazz groups. It also offers master classes for music students and meetings with the legends of Soviet jazz. “In folk tradition it’s also customary to improvise. The same song sung by different old village women always sounds different!” said Valentina Savenko, leader of Rostan. This year, the famous American saxophonist Ernie Watts performed at Jazz Province. Watts first made his name in the 1960s. Today his solos are taught in music schools, but his “Highway Blues” (recorded with Marc Seales) is familiar to most computer users as part of Music Models Windows XP. The surprise of this year’s festival was a joint performance by a Russian-American jazz quintet and the folk ensemble Rostan from Kursk Region. A saxophone, bass guitar, electronic keyboard and drums shared the stage with girls in homespun peasant Russian dresses similar to those worn 200 years ago. The Russian folk ensemble performed authentic renditions of ceremonial songs, while the jazz group improvised on Russian folk themes. Folk improvisation depends on one’s mood. The American performers - guitarist and all-round musician Mike Miller, drummer Joel Taylor (a Jazz Province regular) and bass player Kip Reed - found this difficult at first. After all, jazz variations are constructed according to canons. But in the end, the Americans were all pleased with this experiment and even recorded a studio album with Rostan. This unique music festival was the brainchild of the master pianist Leonid Vintskevich. For the past 30 years, Vintskevich has been playing with the world’s leading jazz musicians, even though he prefers to live in his native Kursk. In 1989, when jazz concerts were of little interest in the Soviet Union, Vintskevich was a guest at Lionel Hampton’s prestigious festival in the American town of Moscow in Idaho. With a population of only 25,000 (a fraction of that of Kursk), every evening’s performance was attended by some 10,000 fans.